Hedge Fund. Noun. An ingenious device by which the rich get richer even while every other poor SOB is losing his shirt. -The Anarch's Dictionary, Volume Who's Counting? See Sure Gamble for similar review ;) This card is pretty much identical, and there is a great Pro/Con review under Sure Gamble. It is a staple economy card, and all economy Operations should be compared to it - 5 credits investment to make 4 credits profit. Sweeps Week usually provides the same bonus, for only 1 investment but only certain times it can be used. Successful Demonstration gives a 5 credit profit, for a 2 investment but the requirement that you stopped a run, which usually means either a) you're Jinteki: Replicating Perfection and they just jacked out of a central to run a remote, or you rezzed an ETR they couldn't break, which makes it a bit more difficult to fire. Celebrity Gift is two clicks but gives a seven credit boost, (So six credit gain if you count that click as 1 credit) at the cost of revealing your secrets. The most boring card in the game, along with Sure Gamble. Also the most ubiquitous. I bet you forgot it even had a theme. You just see the moustache guy and take four. 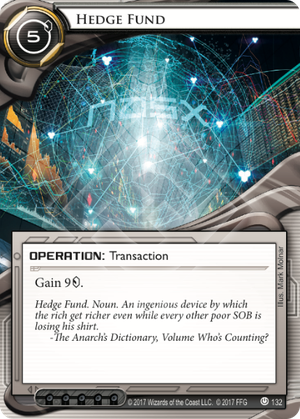 Unless your deck has a strangely robust economy, you should probably have some Hedge Funds in it.